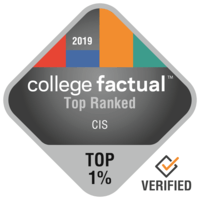 2019 Best Computer Information Systems Colleges in the U.S. There are about 32,472 students graduating with a degree in Computer Information Systems every year. This makes it 17th most well liked from the 384 total college majors in our database. Students who graduate with a Computer Information Systems degree enjoy a 16.0% improvement in income when compared to their college-educated peers. This means the major is rated 25 out of 121 with regard to salary potential. CIS grads will make around $49,100 in their early career income and $85,965 in their mid-career income. Below you'll see a list of the best colleges and universities to study Computer Information Systems. Our ranking methodology takes into account education quality, average earnings of graduates, accreditation, and several other relevant factors. The best school in the United States for Computer Information Systems is New Jersey Institute of Technology. New Jersey Institute of Technology offers graduate degrees in cis for those interested in an advanced degree. Newark, New Jersey is an ideal setting for young people who get pleasure from the busy urban lifestyle. New Jersey Institute of Technology also has graduate degree programs for those who want to continue after achieving a four-year degree. Considering that 57.0% of students at New Jersey Institute of Technology obtain financial aid, be sure to complete the FAFSA. If you're interested in knowing more, you will find every one of New Jersey Institute of Technology's rankings here. It's difficult to beat Georgia Institute of Technology - Main Campus if you wish to pursue Computer Information Systems as a major. A popular choice for undergrads, there are roughly 458 learners studying this degree at Georgia Tech. The setting in a large urban center is great for young people seeking ample choices for networking, excitement, and exploration. Georgia Tech features a high performing men's football team. Graduates of Georgia Institute of Technology - Main Campus usually don't have difficulties paying off their student loans; only 1.2% have defaulted on their loans. Want to know more details on Georgia Institute of Technology - Main Campus' campus? Have a virtual tour. Carnegie Mellon University is among your best bets if you want to study Computer Information Systems. Carnegie Mellon University computer information systems graduates make 22.6% more than the typical cis grad. Based in Pittsburgh, Pennsylvania, this institution is a very good option for students who enjoy the thrill of a significant city. Concerned that you can't afford Carnegie Mellon University? Don’t allow that to stop you from submitting an application since 52.0% of students get financial help. Score higher than 32 on the ACT? That is over the typical applicant score, so you have a good possibility of getting in. Ever wish you had a simple way to find out how a school is performing across all areas? Now you do. Have a look at Carnegie Mellon University's scorecard. Every student who is interested in Computer Information Systems needs to check out University of Pennsylvania. University of Pennsylvania offers graduate degrees in cis for those interested in an advanced degree. University of Pennsylvania is among the largest schools in Pennsylvania. 54.0% of students at University of Pennsylvania acquire educational funding, so don't forget to complete the FAFSA! Graduates of University of Pennsylvania usually do not have problems paying back their student debt; just 1.1% are in default. Want to learn more about University of Pennsylvania's campus? Take a virtual tour. James Madison University is a good choice for students pursuing a Computer Information Systems degree. Students who graduate from the cis program make around $60,595 in their early career salary and $104,089 in their mid-career salary. Harrisonburg, Virginia is an ideal environment for individuals who enjoy the fast-paced urban lifestyle. JMU's women's softball team is a goliath you are sure to love watching. Due to its commitment to high academic standards and its yearly net price of $23,802, James Madison University is a good bang for your buck. Get an idea of what student life at JMU is really like by seeing a few campus videos. Every student who is interested in Computer Information Systems has to check out New York University. New York University offers graduate degrees in cis for those interested in an advanced degree. The location in a major city is great for scholars trying to find adequate opportunities for social networking, adventure, and exploration. You may want to invest in an ACT preparation class before you take the test because the typical ACT score is 31. There is a graduate program available for students who are interested. The scorecard provides a great overview of New York University. Every student who is interested in Computer Information Systems has to look into University of Washington - Seattle Campus. University of Washington - Seattle Campus computer information systems students make 15.6% more than the average cis student. University of Washington - Seattle Campus is among the largest schools in Washington. 94.0% of first-year students come back for their sophomore year of school. University of Washington - Seattle Campus offers graduate degree programs for those who need to keep going after earning a four-year degree. Learn more and see just how University of Washington - Seattle Campus ranks in other categories. It's hard to find a better school than Cornell University if you wish to study Computer Information Systems. In addition to its bachelor's programs, Cornell University offers graduate degrees in CIS. Ithaca, New York is an ideal environment for college students who enjoy the fast-paced urban lifestyle. This institution is an excellent value for students in New York. Parents, you will be happy to find out we feel Cornell University has a comparatively low crime rate. Take a deeper dive to see just how Cornell ranks in other categories. Any student pursuing a degree in Computer Information Systems needs to look into University of Maryland - College Park. University of Maryland - College Park offers graduate degrees in cis for those interested in an advanced degree. Positioned in College Park, Maryland, UMCP offers a dependable, suburban environment for young people. 95.0% of freshman students come back for their 2nd year. The average scholarship amount awarded to first years is $7,705 with 52.0% of first years getting an award. Ever wish schools were graded with a report card? Now they are. Look at University of Maryland - College Park's scorecard. Johns Hopkins University is among your best bets if you want to study Computer Information Systems. Cis majors from Johns Hopkins University get a earnings boost of approximately 8.8% above the typical income of computer information systems graduates. The setting in a major city is tremendous for students trying to find adequate opportunities for social networking, adventure, and life. Johns Hopkins has been rated among the best for quality of education for veterans and active-duty military. Students from outside the U.S. make up 18.8% of the population at Johns Hopkins University. The scorecard provides a good review of Johns Hopkins University.